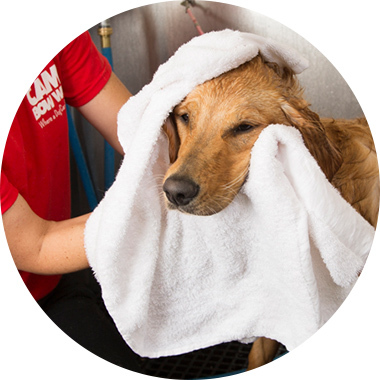 Contact us at (262) 547-9663 to learn more about our dog grooming services. Dog Weight: 1-25 Pounds. All baths include shampoo/conditioner, a simple brush, and blow dry. Dog Weight: 26-50 Pounds. All baths include shampoo/conditioner, a simple brush, and blow dry. Dog Weight: 51-100 Pounds. All baths include shampoo/conditioner, a simple brush, and blow dry. All baths include shampoo/conditioner, a simple brush, and blow dry. Get 50% off any nail trim when scheduled with a bath.